I have been using instructions from reading other posts on removing the problems i had. However I am unable to comple the last stage,. I have used highjackthis, Vundofix, combofix, Eusing Registry Cleaner, Spybot - Search & Destroy, avast. are bad things, but im uncertain. 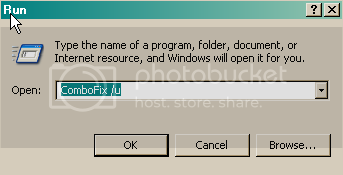 any help would be usfull, its always good to learn how to fix the problems myself, but im unable to..at the moment heh..
ok, using hijackthis yourself to remove bad entries was a risk, but hopefully you have not removed any good entries. i should let you know however that if you have removed a good entry and if we are unable to restore it then, once we have cleared your machine of malware, i will have to direct you to another part of the forum for help. going forwards, i would not advise doing that again. that said, lets see what we can do. Looking through your combofix and hijackthis report it looks like we have more to do. though, yes, you were correct, you did/do have a vundo infection amongst others. and yes those hijackthis entries you highlighted were once bad entries which we will clear later. i know you have run it and attached the logs, but i want to re-run combofix and for you to post the log in your next reply, along with a new hijackthis log. although i think i used the new combofix seeing as i downloaded it 2 days ago, i did re-download it to my desktop as instructed, i also checked if there was any updates for HijackThis, its fully updated. i've scanned through the log and again the only 2 things i can see out of place, are as follows. my system seems clean, from what i can see, but im not sure ^^ sorry for rambeling, i just want to make sure you have all the details so you could help if there is a problem within the logs. P.S if you would like me to post future logs, and "quote" is inconveniant, i can post them as "attatment" if you wish, whatever makes it easier for yourself. hijackthis is a scanning and fix tool, it does not itself specifially identify any malware. hence, it tends not to be updated too often. your gut feeling is correct. in this post we will clear out what i can see in the combofix and hijackthis logs. you can just copy and paste the logs into the reply - though occassionally if nothing happens then put them in quotes. no need to attach the logs unless i ask for that. Hello, and again, thank you for the reply. and these are the new logs. ComboFix Log is as follows. the file i created automaticly got deleted after the reboot when i draged it onto the combofix icon. it removed some bad files, bad folders, bad drivers and bad registry entries. Hijackthis looks at registry entries and can remove them. we merely took the opportunity to remove those bad registry entries as part of the combofix script and therefore saved us some time. your logs are looking better now. in this post we will do a couple of scans to see what else is on your machine. also, i dont see an antivirus program on your machine - is this the case? you are correct while doing them scans i did not have a virus scanner installed as i said in my first post, i have advest, but i uninstalled it after i "assumed" my computer was clean, it has been installed again since the last post. the online scanner says i have virus's but every scan i do, there are none, everything is totaly clean yet it says its got some. the computer is loading faster now, i dont have pop up's. and ive installed a custom made regedit to put my C drive icon back from the red cross i said i have, to a normal icon. so all in all. i cant find any problems with virus's and adware, yet the one scan shows i have some. but i cant fine it/remove it. good news, always have one, and only one, antivirus program running on your machine. in todays world not having such protection is an invitation for trouble. the online scan was picking up some infections in your restore points which we will clean out, so no problems there. in this post we will flush your temp folders, clear away the fix tools, reset your restore points (there are infections lurking in there) and then i will leave you with some ideas on how to improve the protection of your machine against future infection. Hello, and thank you Andrew. Glad to hear the system is clean ^^ now i wont have my girlfriend complaining heh, "omg is that virus scan completed yet" ect. glad to see you have joined GeekU - goodluck in your training!